The 1000-member ensemble Kalman filtering with the nonhydrostatic numerical weather prediction model on the K computer. 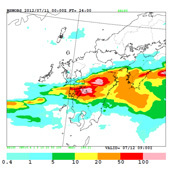 The Meteorological Research Institute conducted data assimilation and ensemble forecast experiments for the heavy rainfall event occurred in northern Kyushu in July 2012, which caused serious damages over Kumamoto, Oita and Fukuoka. The results indicate torrential rainfalls can potentially be captured 12-24 h before the occurrence with high probability. 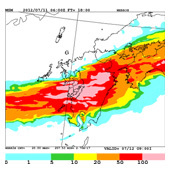 Figure 2 shows 3 h accumulated precipitation in a single forecast initiated on 1500 JST 11 July 2012, showing good agreement with the corresponding observation (Fig. 1). In addition to the deterministic forecast, probable maximum precipitation (Fig. 3) and probability of precipitation with a threshold of exceeding 50 mm per 3 h (Fig. 4) can be estimated from ensemble forecasts. These probabilistic information for strong rainfalls over specific areas with a lead time of 12-24 h would be useful for preventing and mitigating natural disasters. For these experiments, the local ensemble transform Kalman filter (LETKF) with 50 ensemble members were carried out. This is the first full-scale experiment where the K computer is used for a research on prevention of natural disasters. It is expected that this outcome would contribute to improve the prediction of local severe rainfalls in future. （Right）Figure2: Probable maximum rainfall estimated from the ensemble outputs. （Left） Figure3: Simulated 3-h accumulated precipitation in a single forecast initiated on 1500 JST, July 11, 2012. （Right）Figure4: Probability of precipitation with a threshold of exceeding 50 mm per 3 h estimated from the ensemble outputs.